Addie “Frances” Suarez- Whitehead, 81 of Pensacola, Florida passed away on January 30, 2019. 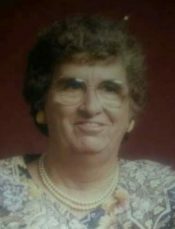 She was a homemaker for many years before retiring from Escambia County School District Food Service Department for 28 years and was a member of Leonard Street Church of Christ. Addie is preceded in death by her latest husband, Alvin Whitehead and the love of her life Robert Sylvester Suarez, Sr.; her brother, John Farmer; and her sisters, Vera Kolb and Annie Ruth Morris. Addie is survived by her daughters, Elaine Bitzer, Robbie Stroud, Sylvia Larson (Larry), Frances Hiscock (Kirk), Debbie Johnson; son, Robert S. Suarez, Sr. (Lisa); daughter, Elizabeth Cox; sister, Willie Mae Walters; brother, Robert Farmer; 17 grandchildren and 29 great-grandchildren. A visitation will be held at Pensacola Memorial Gardens Funeral Home on Monday, February 4, 2019 from 10AM until the service begins at 11AM. Pallbearers will be her grandsons. I am so sorry for your loss. Keeping all of you in my thoughts and prayers.